A little while ago I signed up for smiley360.com in hopes to get the chance to try out and review new products! WELL, I got my FIRST product the other day! Let's face it, I have 2 young children... we have more boo-boos and owies than you could possibly count and naturally we go through Band-Aids like it's out job! So I was thrilled to review the new Mickey Mouse Collectors Tin. (Plus, Charlotte absolutely LOVES Mickey Mouse). I LOVE LOVE LOVE the box! It is going to be my new "diaper bag Band-Aid box"! It is crush proof and ADORABLE! The images are way too cute! I especially love Donald Duck's face in the far right one. Whenever Charlotte gets a boo-boo, she immediately asks for her "Mickey Box". It doesn't matter if she actually drew blood... she wants her "Mickey Box". We've gone through at least 6 Band-Aids in instances where Band-Aids weren't required, but Charlotte would not give up until she got her "Mickey Box". Clearly, I will be ordering more Mickey Band-Aids from Amazon. Who loves her new Mickey Band-Aids? If you would like to join the smiley360.com community and get the chance to try new products (services and experiences), visit here. 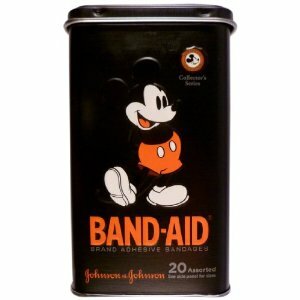 I received a free sample of Band-Aid's Limited Edition Mickey Mouse Collector's Series Tin from smiley360.com in exchange for a product review; All thoughts expressed are my own. I was not compensated for my post. These are such cute band aides!!! Awww...how adorable! Love love love Disney. :) I'm following you from the blog hop. :)) I would love to hear from you too.